Ron and Hermione. Some of these are canon illustrations, others are illustrations of fanfiction, but all are romione so I'm happy!. 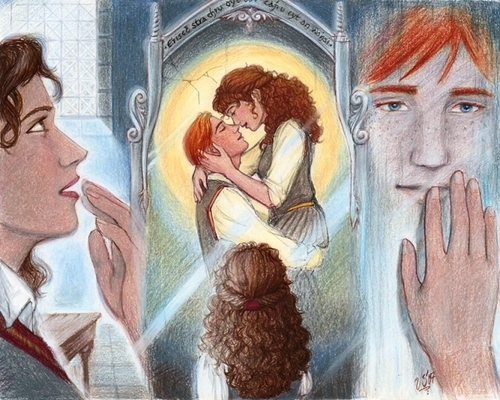 Wallpaper and background images in the romione club tagged: ron harry potter hermione fan art romione images. Cool?.. Sorta weird but Love it! I love it! So great that it isn't the normal you'd think Hermione would see in the Mirror of Erised. This one is my favorite now!! awww Mirror of Erised, Hermy version! I always wondered what she would've seen.